Begin your journey by selecting an experienced provider that you feel most comfortable with and schedule your initial consultation. Come in for your initial consultation where we will can answer all of your questions and discuss whether Invisalign is the best treatment option to get you the results you’re looking for. We’ll also go over cost, insurance and payment plans. Your doctor will take x-rays and impressions of your teeth, to create a digital 3-D image that will be used in the development of your specific aligners. You’ll walk away with a precise treatment plan, created specifically for you! 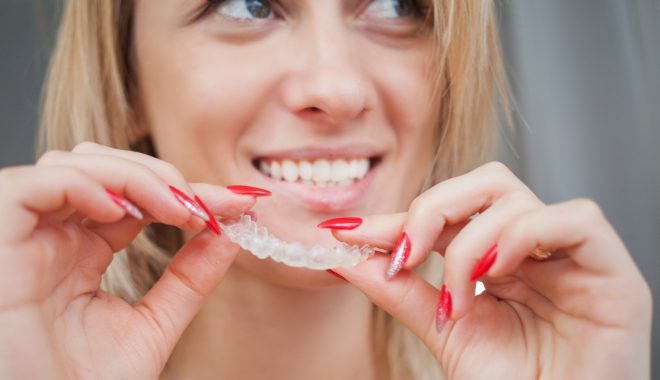 Take your smooth, comfortable, BPA-free aligners home and simply begin to wear them throughout the day, removing them only when you eat or to brush and floss your teeth. As you wear each set of aligners, your teeth gently and gradually begin to shift into place. You’ll begin to see results in just a matter of months! Approximately every two weeks, you will begin wearing a new set of aligners, advancing you to the next stage of your treatment. To monitor your progress, you will also have occasional checkups with your doctor. A complete Invisalign treatment time can range from anywhere between 6 to 24 months, but the average adult will have a new and improved, beautiful smile within 1 year. Why Do Patients Prefer Invisalign Over Traditional Metal? Our team of specialists offer the latest Invisalign treatments. Our experience combined with the benefits of Invisalign technology, offer you a faster, more comfortable smile without the need for braces. With results within 12 months you’re going to love the new you! Before Invisalign, one of the things that bothered me was my ability to present in front of clients because I was always self conscious. Since I got the Invisalign treatment, I have more confidence! Easy, flexible office visits just once every 6 weeks – perfect for the busy professional!